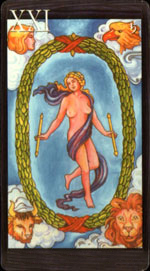 The card illustrates a half-naked woman inside a wreath, holding a wand in each hand. Around the wreath there are heads of a man, an eagle, an ox and a lion. This card is a symbol of a free person, who found his second half, reached harmony with the universe and the highest level of knowledge. This card best symbolizes the victory of a human over his weaknesses, which pulled him down to the earth and to the rough material goods. You have ceased to be a slave of your desires and passing passions. You’re no longer chasing the ghosts, which attract many people around you. You have finally found that inner balance that allows you to separate true desires from casual, and which gives you great opportunity to control your own destiny. The long period of doubts and agonies, when you didn’t know what your destiny is or in what way you’ll achieve what you want, has ended. You finally came to the light from a valley of mist and shadows. Not so long ago you were afraid to step aside for fear of losing the already barely visible path, but now you have an infinite number of roads and trails illuminated by the light of a sun stretched in front of you, which you can choose from. In a past this variety would have confused you – so many ways, and it is not clear which one to choose. But now you have a flawless intuition, which allows you to select one correct path from a large variety. If this card happens to appear when practicing divination on a specific situation, the World card shows that all initiated works and actions will be successfully completed. Card predicts an undoubted success of what was conceived, regardless of the scope. When aligned to negative cards in a spread, the World card may talk about loneliness or dissatisfaction, which can greatly slow down the progress of a case or prevent an achievement of a target. In general, you should pay less attention to the individual interpretation of the card, and more to the interactions with the neighboring cards in a spread. Success, series of good events and achievement of goals. In practical terms, the card is favorable in all respects. Additional Card Meanings: Award, emigration. Expected results are far away, but don’t lose hope. Sometimes it can mean success, associated with disappointment or failure in love. Find your place and enjoy your life. Once you’ve reached the goal, don’t hurry to rest on its laurels. Today, you feel an unusual burst of energy and your harmony with the environment. All the things you have conceived are going well, or maybe you just don’t pay attention to noises. Enjoy today, that heavenly peace, and pleasure your soul. If you’re looking for a shelter in a physical, psychological or a spiritual sense, today you can make an important step in this direction. This year you’ll finally have a chance to find your true place in this world, to find happiness and joy of life. It could be a new level of consciousness or a spiritual haven where you will feel comfortable. This year you will connect all pieces of the puzzle, and thus all areas of your life will combine a harmonious whole. You will feel harmonious with the world.